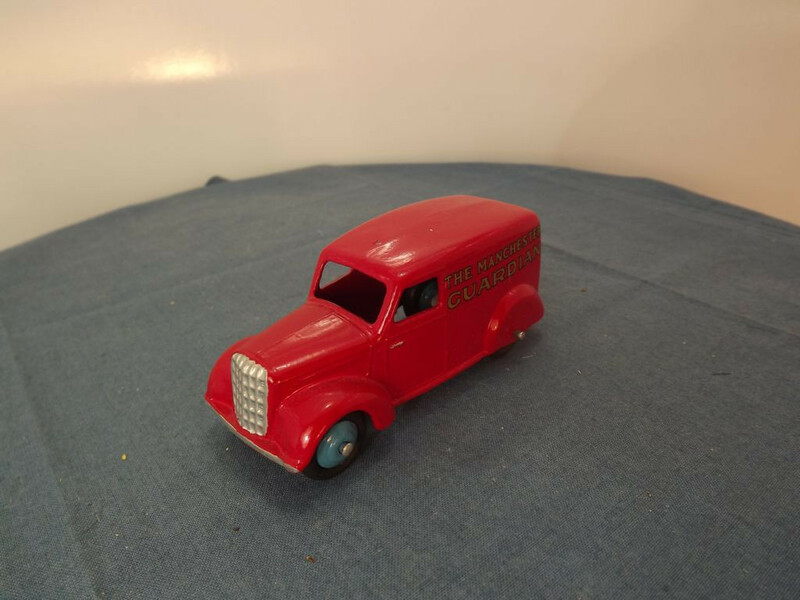 This model is the Dinky 28c-G-3 Bedford Delivery Van in Red Manchester Guardian livery. The 28c was originally issued between 1934 and 1940. This Code 3 has been reproduced quite well, probably using a 34c/492 casting as there is evidence of a repair to the roof where the Loudspeakers would have sat. 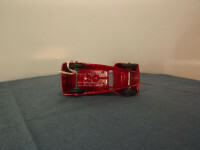 The model features no opening parts, all features are cast into the body casting. This version uses the 3rd casting type of the Bedford van with mesh grille pattern and three engine louvers. There is no interior or glazing on this model. The front bumper, wheel arches, bonnet, radiator grille and headlights are all details molded into the body. The radiator grille, door handles, and front bumper have been picked out in silver. All wheels are of the shaped cast metal type - solid one piece cast metal hubs, painted blue, with a separate black "rubber" tyre. 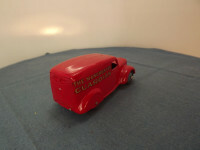 There is no base plate on this model, but the underside of the roof bears the legend "Dinky Toys" at the centre top, "Made in England" in the middle centre, and "Meccano Ltd." at the centre bottom. The original Manchester Guardian van was issued in 1934-40 — this code 3 version was probably made between 1975 and 1990 by a private collector for his personal collection and it has now passed into my care following his death.